Has anybody confirmed that the injectors are the factory green or tan NA injectors and not the purple/brown turbo injectors? Always worth confirming. Zed, I knew you'd be back! I have both the FSM & FI Bible (actually printed them both and put them in a 3 ring binder as well - I was feeling ambitious and bored). Nah, just plain old chicken. Well those numbers look a lot better than the measurements you were getting with the previous gauge. I'm less concerned with the absolute numbers than the fact that it seems to be reacting to manifold vacuum now. Just changing the gauge shouldn't have had any effect on that, but whatever.... Now it just looks like most other old 280Z's that are running either really rich or really lean because of a whole bunch of interrelated issues like dirty connectors, improperly placed connectors, and vacuum leaks. Back calculations from the pressure differential to calculate what the manifold vacuum is in psi... Do the numbers make sense? With the filler cap on and the engine struggling at 400-500 RPM... Decrease of 2 psi converts to 4 inches of mercury. With the cap off and the mixture more conducive to a smoother and higher idle... Decrease of 4 psi converts to about 8 inches of mercury. Did I do that right, and does it make sense? With the filler cap on and the engine struggling at 400-500 RPM... Decrease of 2 psi con﻿verts to 4 inches of mercury. With the cap off and the mixture more conducive to a smoother and high﻿er idle... Decrease of 4 psi converts to about 8 inches of mercury. OK... So the more important question. But kidding aside, I really don't know if that makes sense or not. How is it supposed to perform? At idling speed, an engine at sea level should show a steady vacuum reading between 17" and 21" HG. A quick opening and closing of the throttle should cause vacuum to drop below 5" then rebound to 21" or more. If a normal engine is supposed to be 18 in-Hg, and calculations indicate you're getting 4 in-Hg instead of 18? A massive intake manifold leak could maybe account for that, but it would be running way lean, not way rich. I'm hoping someone can chime in and show me that I screwed the calculations somehow. CO, I think you are right on all accounts and what I'm dealing with is a number of problems inherited from the PO, where they just kicked the can down the road on these issues to be dealt with later.... well later for the PO seems to be now for me. I have read through the service notes from PO's Mech (pretty extensive), and it indicated that the engine was running rich (failed smog), and that there was a vacuum leak that was repaired, which would have made it run lean (although I do not have details about that yet - going to put a call into the PO's Mech and see if I can get more info about this). However PO's Mech. indicated that he leaned out the engine to pass smog. The car did pass smog and was driving OK (I've put about 150 miles on it since purchased at end of January 2019, half of which was driving the car home after the initial purchase), up until this problem just presented itself when the car refused to start while out for lunch about 5-6 weeks back. 1). Clamp off the fuel supply to the cold start valve to be sure it is not providing excess fuel into the engine if it is malfunctioning. 2). Check Water Temp. Sensor at 36 pin connector. 3). Check AFM air temp sensor and the Static reference resistance readings. 4). Check that TPS sensor is working per the FSM. I'm reading up on these tests now trying to educate myself so as to be not quite as ignorant, and once I have the knowledge and the time (hopefully by this coming weekend or sooner), I'll be able to perform these checks and report back the findings. I remember a past thread, maybe several, where intake vacuum was being used to diagnose an engine problem and they had a really low number. My premise at the time was that intake vacuum only really showed the quality of the pistons, rings, and valves and wasn't good for much else. Then they found a giant vacuum leak. The lesson I got from that was that intake vacuum is really only good for the fine details. I could be wrong, of course, but I don't get much out of intake vacuum readings when they are way off. In theory, if the injectors are squirting enough fuel, you could have a leak so big right at the injectors themselves, that intake vacuum could be close to zero and the engine would still run. Air and fuel get sucked in by the pistons, they don't care where it comes from. Maybe the PO's mechanic didn't find the main vacuum leak and adjusted the AFM to compensate. Might be time to be squirting some carb cleaner or similar at the usual leak points. The base of the injectors is a good start, since they were worked on. The big positive here is that the engine will idle steadily. So you can run a bunch of tests. Take good notes and don't assume anything. Get numbers. a couple things on that vacuum reading, the 17" or higher, that will be on a warmed up engine, I noticed mine is about 15" right after startup, works its way up to about 17".It also presumes an optimal running engine (highest RPM for most closed position of throttle plate). Ign timing will effect it as well since that again effect over all efficiency of the engine as an air pump. I am not surprised the vacuum is not as good as it should be given the poor state of the A/F mix. He is down the normal A/F mix problems we all suffer from after drift of sensors/corrosion on a open loop EFI system. oh forgot to ask, are you still having NO effect with the idle adj? that one reduces idle CW increases idle CCW, its an air bleed system not a throttle plate position set. Also did we ever address the AAR its sort of a idle up air bleed for when the engine is cold. But the real problem is still the excess fuel anyway you cut it, badly carboned new plugs after a short run would tend to say the EFI is allowing too much on time for the injectors. Since it seems that the PO's mechanic might have "hacked" some things to get it to pass emissions, a new plan might be in order. A basic tuneup maybe. Confirm initial timing at idle, confirm valve lash is set correctly. Have cylinder pressures been measured yet? Has the cylinder head and block combination been confirmed? There is a low compression ratio NA engine floating around out there that we helped a guy put together. It would be nice to see a summary of engine specs and actions taken so far. Cylinder head, block (the engine serial number should match the plate on the fender well). Too many pages to go back through the whole thing. My 76 has a 78 engine in it and a bunch of other minor mods. You never know what the trail of PO's have done. From Post #1 - "1976 280z California edition (manf. date Sept.1975). Bought the car in late Jan. 2019, car passed emissions test and it started and drove fine until 2 weeks ago when problem first occurred." All good threads must come to an end.... even though this thread was not so good, it's time has come. Thank you for your methodical approach and patience while this got sorted out. 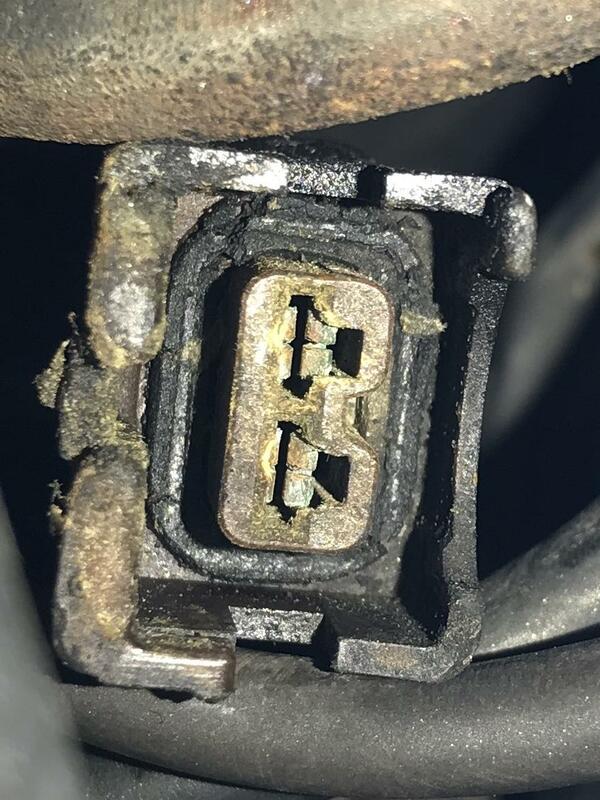 The issue was the cable from the bullet connectors to the Water Temperature Sensor connector. (not the WTS itself). A $6 replacement cable from AutoZone fixed the issue and the car is running better than ever! Much appreciated and I'll reach out next time I need expert advice! Excellent!! So maybe all of the fuel pressure stuff was a red herring caused by questionable test equipment and procedures? 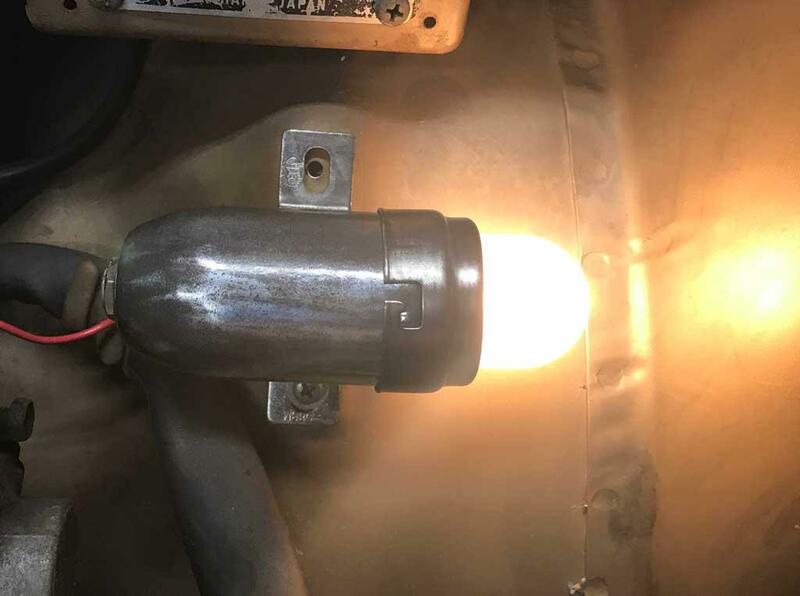 In any event it reinforces the belief that it just looks like most other old 280Z's that are running either really rich or really lean because of a whole bunch of interrelated issues like dirty connectors, improperly placed connectors, and vacuum leaks. So you found the first, highest priority of those, but there are probably others of lower contribution and impact. The remaining issues are probably what the previous owner's mechanic was chasing to get it to pass smog. So maybe all of the fuel pressure stuff was a red herring caused by questionable test equipment﻿ and procedures? Absolutely! The equipment was faulty, however I think the procedures were sound as they yielded good results with different equipment. Exactly! I don't think the PO's Mech. did anything wrong or dubious or acted with malintent. Quite the contrary, he's a solid mech. that was doing what his client paid him to do... get it to pass smog and sell it. The PO's Mech. is actually a pretty solid dude with a wealth of Z knowledge and experience. I've spoken with him several times and he's given me the full service records going all the way back to 1976. I don't find any fault with him, he's trying to run a business and a good one at that. Like you said C.O. it's just an old Z and these problems come with these cars. Case in point, yesterday I "fixed" the inspection lamp... the bottom just needed to be cleaned so a solid ground connection could be made (I still need to fix the toggle). I'm sure I will find many more electrical connections and hoses that need replacing. So when the temp sensor input is actually making it to the ECU, how does it run? How do the plugs look? I'm a little concerned about the pic you posted of the insides of the AFM. Since you have a good report with the PO's mechanic, can you (did you) ask him if he adjusted the AFM to try to lean things out? how does it run? How do the plugs look? It's running good, I pulled the plugs this morning and they look kinda white/grey at the tips, not black like before when running rich. Since you have a good report with the PO's mechanic, can you (did you) ask him if he adjusted the AFM to try to lean things out? Not yet, but it's on my list of calls this week. That thought crossed my mind and I do want to know what he did so I can "UNDO IT" if needed. Happy Easter all, thanks again for the much appreciated help! At least you're more honest now that your problem is fixed. You were hedging your comments when you needed help. I'll take down the picture if you stay off my threads, and I'll stay off yours. We can be like 2 ships passing in the night. Zed, I just blocked you. Goodnight.